Logistical Worlds: Infrastructure, Software, Labour studies Chinese-led globalization and the role played in it by logistical operations and related infrastructures such as ports, railways, pipelines or IT networks. The project seeks to understand how global logistics is reshaping global governance and the relations between political command, institutions and economic calculation. The research is being developed around three main sites: Piraeus Port in Greece, the port area of Kolkata (Calcutta) in India and the complex of Chilean logistical infrastructures, including the port of Valparaíso. As logistics is a relatively new research field for social and political sciences, scholars are experimenting with new research techniques in order to better comprehend what is happening inside and around logistics. The approach Logistical Worlds has inherited from its predecessor project Transit Labour is that of research platforms. Research platforms provide a conceptual and technical project collaboration and management model that coordinates researchers from different locations and disciplines around designed empirical investigations. Using digital technologies to create a variable and expanding commons of participation, platforms also facilitate the orchestration of collective research across different global sites in ways sensitive to the complexity of relations within and between locations. They mobilize a large range of disciplines, from political theory to media theory, and methods, including fieldwork, interviews with logisticians and workers affected by logistical transformations, digital modelling and game design, and the more classical desk research. Why logistics? It is worth raising this question, given that logistics is most commonly associated with the military, management sciences and transport studies. Nevertheless, the scope and significance of logistics is continuously increasing. The shift from simple physical distribution or storage to complex systems of supply chain management brings about a fundamental transformation that is crucial to understanding the material dynamics of globalization. This process is relevant for a wide range of conditions and forces that go well beyond transportation, even if what a classic article by W. Bruce Allen almost twenty years ago called ‘the logistics revolution’ had a strong impact first and foremost on transport. Indeed, the growing importance of supply chains in the production process was preceded by and associated with a deep reorganization of management. The result was a new balance between physical distribution and the way in which the production of value is understood and pursued. With the advancement of the principle of total costs, production has become a flow that spills over the factory gates and extends to the customer. Through the deployment of complex and multi-layered supply chain networks, transportation has become part of the production process as never before, making the spatial and temporal dimensions of production with regard to movement increasingly relevant to an understanding of the global economy. We can attribute two equally relevant characteristics to this process. First, there is an intensive process that changes the organization of production inside firms at the local and national level, as the history of containerization in the United States shows. Second, there is an extensive process that introduces new scales and spatial dynamics and reorganizes the global via transnational chains of production and value generation. The sharp rise in commercial traffic and financial exchange is just one of the manifestations of this material structure of globalization. The aim of Logistical Worlds, nevertheless, is not strictly to increase knowledge on the universe of logistics, but rather to argue that logistics is a larger political fact which produces a complex and still overlooked redefinition of the spaces of government, the dynamics of command and the organization of labour. The pervasiveness of public-private partnerships, the redefinition of entire territories as Special Economic Zones, corridors or concessions, the algorithmic parameters and software that organize and control ports, large ships and production chains – these elements are part and parcel of emerging logistical worlds. Beyond their practical and immediate functions, such as moving goods, storing or assembling parts and organizing warehouses, logistical operations bring about a production of norms that is eccentric in comparison with the laws and regulations produced by representative political institutions and their international correlates. Yet these norms are equally – or even more – effective in the definition of fields of intervention, behaviours and consequences that are not limited to any specific industrial sector. Logistical Worlds argues that logistics is an emerging form of governance, global in scope and digitally controlled, that operates on a transnational scale, following its own organizational principles in ways that reorganize space and time. ERP (Enterprise Resource Planning) and TMS (Transport Management Systems) software compute large amounts of real-time data within a finite range of parameters in order to forecast the consequences of any given action and, following models and task sheets, prescribe choices and behaviours. The use of business intelligence systems inside supply chain management integrates the concepts of visual supply chain and visible supply chain. The aim of the ‘visual’ supply chain is to model the entire supply chain by employing graph theory in order to define and sustain the decisions of company operation management units. The ‘visible’ supply chain, on the other hand, uses technologies such as Radio Frequency Tags to monitor movement and operations along the supply chain and to command real time adjustments or solutions to problems and underperformance. Extensively using Key Performance Indicators (KPIs), these systems organize the materiality of logistical operations, viewing human action, namely labour, as nothing more than technical data that can be manipulated for purposes of optimization. This casting of labour as data inevitably produces friction in the workplace and, when the system works properly, a sharp deterioration of working conditions under the continuous pressure of performance efficiency. The increasing number of labour struggles, strikes or blockades that constantly occur at logistical sites around the globe – even if they often take place behind the veil of gated infrastructures – is thus a constitutive feature of logistical worlds. Manual workers such as storepeople, dockers, drivers or manufacturing workers are the most directly hit by the clean command of logistics. Nevertheless, the above mentioned datafication of human labour, and the subsequent loss of independence and contractual power, has hit every level of the logistical chain, including professional and other higher positions, increasingly restricting the agency of any singular actor. Today the much of the industry is dominated by discussions of green logistics – the new keystone to maintaining profitability in an era of naval gigantism, enforcing reorganization of the supply chain in the midst of a crisis of credibility for many global firms and acquiring public legitimacy for interventions at the micro level of urban logistics. But the consequences felt on the ground remain in the shadows, first and foremost the degradation of large portions of land for logistical infrastructure and the deterioration of labour conditions. Logistics, commonly associated with circulation, has an extreme and continuous need of physical space – for infrastructure, warehouse storage, the accommodation of containers in port berths and the finishing, processing and packing of goods – and digital space for data storage and software operations. The many conflicts surrounding land use and the realization of infrastructure across the globe reveal how this land-hunger is a continuous source of tension and violence. Such violence screeches against the image of seamless logistical processes that dominates the debates and aspirations evident in industry narratives and the specialized literature. The strikes taking place in large companies that have built their fame on state-of-the-art supply chain management and logistical services – such as Amazon, the Apple-Foxconn cluster or the UPS and TNT warehouses in Northern Italy and elsewhere – shed light on labour conditions inside networks designed to work just-in-time. Overloading, precarisation and the complete availability of the labour force as well as recruitment through opaque subcontractors are the consequences of the total cost calculation and search for efficiency behind the glittering world of logistics. It is worth noting that these conditions are present, even if in different forms, on a global scale, and thus cannot be reduced to local distortions of fairness. Infrastructure is the spatial and material marker of logistical worlds. Logistical Worlds enquires into this dimension, taking as its core research object one of the main infrastructural projects of our time: China’s New Silk Road. The twofold strategy pursued by the Chinese government is built around the twin projects of the ‘one belt, one road’ policy, mandating the construction of both a ‘Silk Road Economic Belt’ and a ‘New Maritime Silk Road of the 21st Century’. The belt project aims to build a pan-Asian logistical corridor to connect Western China with Europe, making Central Asia a new hub for Euro-Asian traffic through high-capacity trains, new towns, land ports, pipelines and industrial and IT hubs. The belt responds to several geoeconomic and geopolitical goals pursued by the Chinese government. If the domestic target is to expand industrial production and urbanization towards China’s Western provinces, its larger scope is to stabilize Chinese hegemony in Asia and to reduce China’s vulnerability towards disruption of energy and oil supply chains crossing the Malacca strait and other regions of the globe under the influence of the United States or other powers. 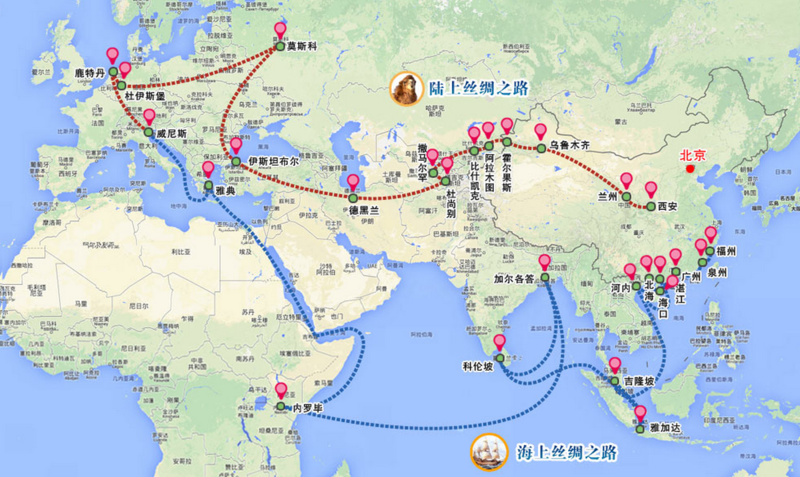 Complementary to this project is the strengthening of maritime connections between China and Europe through the maritime Silk Road. This strategy, based on the new diplomacy of the ‘win-win partnership’ discourse promoted by the Chinese government, entails direct investment via state-backed Chinese operations in ports along the road and the construction of the missing links. The plan, revealed by the Chinese government after years of speculation, includes Asia, Africa and Europe or, in other words, the East and South China Seas, the Indian Ocean and the Mediterranean Sea. Nevertheless, the global reach of the Chinese strategy is clear. Indeed, the new maritime silk road entails other interventions not included in this picture, most notably the activism of Chinese operators in inland Africa, South America and a mega-project to realize the Nicaragua Canal, a would-be competitor to the Panama Canal and game changer in the Atlantic-Pacific routes, by Hong Kong’s HKND (Hong Kong Nicaragua Canal Development Investment Company). Moreover, the logistical operations along the Silk Road economic belt and the new Silk Road initiatives are accompanied by Chinese financial activism and the creation of new financial institutions related to infrastructure diplomacy. One example is the recently funded AIIB (Asian Infrastructure Investment Bank), presented by Chinese president Xi Jinping at the 2015 Boao Forum for Asia as an instrument to create a ‘new normality’ for the Chinese economy – meaning its shift from being the sweatshop of the world to an economic player with spending capacity and a rising consumer class – that would become an asset for the whole region. Clearly, the AIIB is set to create a parallel line of regional funding outside the control of the ADB (Asian Development Bank) controlled by Japan and the United States. Against this background, the first phase of Logistical Worlds focused on the port of Piraeus in Greece, the main port of the country, which has undergone a profound redefinition following a thirty five-year concession of the bulk of its ground-space to the Chinese terminal operator Cosco Pacific. The Piraeus terminal, currently dedicated primarily to transhipment operations, occupies a strategic geographical position from the perspective of the development of intermodal connections between Asia and Europe, not only for China. Its location North of the Suez Canal towards Eastern Europe is indeed strategic both as a hub for distribution in the Mediterranean Sea towards Southern Europe and the Northern Range, and for the emerging networks of production in the Balkans and Eastern Europe. Piraeus can be the link connecting the maritime Silk Road and the Eurasian logistical belt in the supply of existing and future industrial clusters with Chinese participation in Europe. Commercial agreements between electronic producers such as HP, Cosco and the Greek railway company TRAINOSE can thus be considered as a first step that may be followed by many others. For the very same reasons Piraeus is also included in the Orient-East Med corridor and the motorway of the sea connecting continental Europe with Cyprus as part of the transport strategy of the European Union TEN-T (Trans European Network). In the framework of EU transport policy, the Orient-East Med corridor should connect the Eastern Mediterranean region with Eastern European countries and Germany. European and Chinese ambitions thus meet, cross and in some ways clash in Piraeus. For the time being, Piraeus is one of the transhipment hubs in Southern Europe with the highest perspective of growth. Container traffic reached 3.7 million TEUs in 2014 after a skyrocketing rise of 18.5% – up to 3 million TEUs – at Cosco’s piers. An eye on the governance structure of the port reveals that Piraeus is currently governed by two entities: pier 1 is still ruled by the Piraeus Port Authority (OLP), while piers 2 and 3, presently undergoing major expansion, are managed by the Piraeus Container Terminal (PCT), a subsidiary of Cosco Holdings, whose major shareholder is the Chinese state-owned Cosco Group. Inside the port a free trade zone type I under the custom rules of the European Union is also operative. 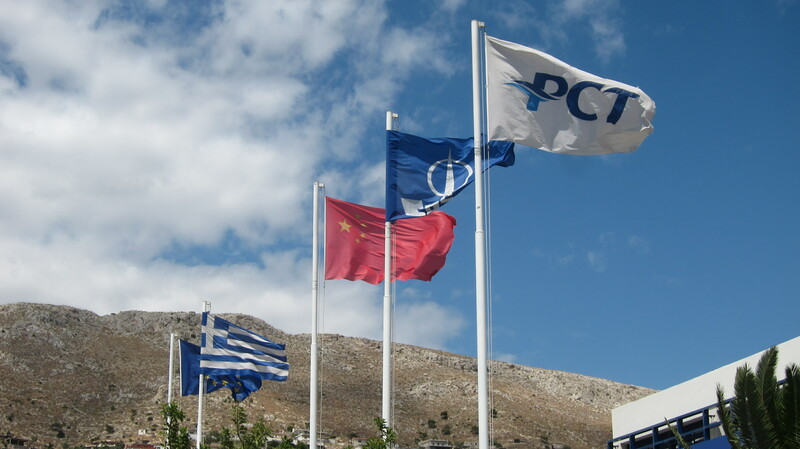 In front of the PCT offices wave five flags: on one side the flags of Greece and the European Union and, on the other side, the flags of China, Cosco Pacific and PCT. These five flags are a clear message of the different layers of governance in this space. During the writing of this text Piraeus reappears in newspaper articles about Greece, mentioned as one of the assets to be privatized under the draconian conditions imposed on Greece by the European Union in the infamous ‘night of Brussels’ between the 12 and 13 of July, 2015. The privatization process involves primarily pier 1 under the OLP, determining what remains of the state ruled port after concessions to Cosco. The tender for privatization of 67% stake in the OLP was launched by the previous government, but the Syriza-led government initially blocked this move in an attempt to reconsider the privatization process directed by the Troika (ECB, EC and IMF) with the creation of TAIPED (Hellenic republic Asset Development Fund). After conflicting rumours and declarations in May, 2015, the government made clear the privatization process was still ongoing, but the sale would be reduced to only 51% of OLP. Nevertheless, the entire sequence of events related to the entrance of Cosco in Piraeus is intertwined with the Greek crisis. Talks between Greece and Cosco began in 2004, but the Greek government was forced to deal with the fierce opposition of dockworkers, who lamented that PCT would not guarantee equal wage and working conditions to its employees. As often happens in these situations, talks and semi-secret negotiations between government officials and Cosco’s management led to strong controversies and the attempt to defend the status quo. The situation changed dramatically in the following years, after the economic crisis in the country worsened, until the signing of an agreement for a thirty-five year concession in 2008 during the visit of China’s president Hu Jintao in Athens, a picture simultaneously in sharp contrast with the growing instability of the country and strongly connected with it. Since the beginning of negotiations, Greek authorities presented the agreement as a great opportunity to promote economic growth and to transform Greece into a global logistical hub. Notwithstanding the opposition and anti-Chinese attitude of many workers, inside the turmoil produced by the rebellion of 2008 and the financial collapse of the country, Cosco’s investments in Piraeus become the main example politicians used to envision a future beyond the crisis through privatization, opening themselves up to foreign capital and logistics. This discourse echoed throughout discussions of the first national strategy for logistics and supply chains and impacted the law on logistics approved in Greece in 2014 as one of the final acts of the previous government, proudly exhibited during the first ‘Logistical Awards’ organized in Athens in May of the same year. It is worth noting that both the national strategy and the law on logistics were mainly modelled after the McKinsey report of 2012 ‘Greece 10 Years Ahead’, which envisioned cargo trade and logistical infrastructure as one of the ‘rising stars’ for recovery and ‘a new model of growth’. Interestingly enough, the report observed that Greece is well positioned on the two major shipping trade routes worldwide and might benefit from transhipment and gateway trade towards the promising Eastern European market. Even consulting companies and the Greek national state, then, beyond Cosco and the European Union, see Piraeus as a key for the future of the region. The plethora of first rank institutions that see logistics as the key for Greece include the World Bank, which in 2013 published a paper with the title ‘Greek Logistics: Unlocking Growth Potential through Regulatory Reform and Complementary Measures’. Nevertheless, as industry operators know, the local impact of transhipment operations is rather limited. The path towards expansion beyond Piraeus is long and full of holes, as demonstrated by the experience of developing a logistical park in Thriassio. To use the language of logistics, the number of bottlenecks to overcome is so high that it seems more prudent to focus on what is happening now than to follow the fantasies of the seamless worlds of logistics. For now, Cosco is expanding pier 3 with the purpose of enlarging the port’s transhipment capacity and is currently waiting for the conclusion of the tender for the privatization of OLP as the major bidder. Meanwhile, labour struggles are also appearing in the PCT-controlled section of the port, and the scenarios envisaged by the serious game Cargonauts (cargonauts.net) may become closer to reality. The creative instability of Greece is a laboratory for experiments of governance and geo-economic relations across Piraeus. But the political situation of Greece brings about a certain degree of creativity, too, and might at any time rewrite allegedly already-written futures. Logistical operations and infrastructural projects may remain in the background in the public discussions and news reports about Greece, but the relation between political processes and the dreams about resiliency of the global corridors of logistics is part and parcel of what is at stake in Piraeus. This relation may take unexpected turns in the future. What we have seen in the past months during the more dramatic phases of the so-called ‘negotiations’ between the Greek government led by Alexis Tsipras and European institutions is telling. Greece is a country with very poor industrial production whose economy relies largely on imports. Yet, it is home to a very powerful shipping industry. Greek owners operate almost 20% of the global fleet of merchant ships – with a fleet size of 4,150 ships worth $106.5 billion – and count for around 7.5% of the Greek economy, employing more than 200,000 people. Almost half of the European Union’s fleet is Greek. Given the industry’s positive outcomes and the historically favourable tax regime aimed at keeping shipowner activity based in Greece, shipping is one of the economic sectors where the Greek government would have space to manoeuver if it wants to distribute the burden of austerity measures also outside the public sector, wage labour and pensioners (as long as a hike in tax rates didn’t result in shipowners finding tax havens elsewhere in Europe). When the Tsipras government announced its decision to reconsider the privatization process, and, at the same time, partially end the tax break in favour of big shipping companies and shipowners, reactions were diverse. On the one hand, internal political opposition, echoing widespread opinions in Brussels, denounced the decision, arguing that the government would, by revising the privatization process, block international investment in the country. At the same time, the proposed tax rise was considered intolerable by the political forces that gave expression to the vested interests of the shipping industry. Shipowners, who proudly claimed they had already agreed to double their contribution to the national budget in tonnage taxes in the period 2013-2017, added to this lament, suggesting they might move their activities abroad and relocate in more friendly countries, including other European Union members such as the U.K., Ireland and Cyprus. In a dramatic declaration, consulting J.P. Morgan analysts observed that the move would ‘potentially disrupt a tradition of shipping in Greece that goes back thousands of years’. On the other hand, Cosco Pacific remained mostly silent, calmly commenting that their interests in Piraeus were intact from the perspective of common interests animating the new Silk Road philosophy. According to Alternate Minister for Shipping and the Aegean Thodoris Dritsas, the Chinese and Greek parties indeed never suspended close communication with the aim of mutually beneficial cooperation. The latest developments after the July 5 referendum and the subsequent reception of conditions that forced the Syriza government to suspend or reverse most of their declared projects shed light on the multiple interests in Greek maritime infrastructure, even inside Europe. The end of tax holidays for the shipping industry is, at this point, considered unavoidable both in Athens and in Brussels. The privatization of the country’s assets remains politically contentious: while most of the observers are deeming the plan to raise 50 billion euros from privatization as unrealistic, unions have already declared their will to resist in Piraeus and Thessaloniki, Greece’s second biggest port included in the privatization process. But other voices can be heard. With perfect timing the Danish shipping company and terminal operator A.P. Moeller-Maersk – who has been already shortlisted as participant in the second phase of the tender regarding Piraeus together with Cosco and the Philippines’ ICTSI – declared its interest in buying stakes both at Piraeus and Thessaloniki. Others players, including transport companies and equity funds from Germany and Russia, are competing to buy state assets in Greek railways, motorways and airports. Even if Greek ship owners are among the wealthiest and biggest in the world, and unions try their best to preserve workers’ conditions, thus, they both lay behind the global giants and forces that are aiming to control the country’s infrastructures. The politics of corridors: a logistical theatre? Piraeus is at the crossroads of intertwined processes that well represent how the global scope of logistical operations is reshuffling existing balances of power and geo-economic relations. At the same time, the dynamics connected to realization and management of infrastructure are contributing to the formation of specific logics extending from the creation of semi-autonomous governing bodies, to the definition of global standards affecting social and labour dynamics across borders and forms of government. There is a specific activism and strategy pursued by the Chinese government-led companies that Logistical Worlds is trying to understand and analyse. Nevertheless, there is something that goes beyond the role of a single power, however big. China’s new Silk Road initiative and the European Union’s corridors strategy, albeit different and with diverse relations between political institutions and private companies, are two examples of how new forms of diplomacy, geopolitical projection and government emerge from logistical operations. Both initiatives show how institutions are driven to assume some of the principles that are typical of logistical operations, such as the concept of intermodal integrated corridors or core networks, behind the imperative of economic growth, competitiveness and efficiency. What is blurring and becoming opaque are the relations between public actors, representative institutions and the logics and governance practices of private companies. This is not something new, as critical readings of neoliberalism and globalization demonstrate. Yet logistics is revealing itself as a global force that organizes space, power and command across existing categories and assemblages. The power to decide and to govern slips away from traditional sites and can increasingly be located as part of the competing politics of corridors that coexist on a global scale. After the study of Piraeus, Logistical Worlds will continue to track logistical power along the new Silk Road with further stages in Kolkata (Calcutta) and Valparaíso to investigate not only how the construction of these ‘logistical worlds’ is transforming the globe but also their social and political consequences. * This is a modified translation of an Italian text published in Dossier Unione Europea Studi e Ricerche.